Spain is divided into several culinary regions. Castilla la Vieja is the land of roasts, Madrid of cocidos (stews), Castilla la Nueva of pistos, Andalucia of fried food, etc. And of course, everybody is familiar with the wonderful paellas, especially from Valencia. Spain produces wonderful sheep's milk cheeses, wines, olives, saffron, fruits and vegetables, and with her immensely long coastlines on the Mediterranean Sea, Bay of Biscay and Arlantic Ocean, a glorious variety of fish and seafood. Smoked paprika, saffron and garlic are important flavors added to many Spanish dishes. In the US, many people do not understand that Spanish cooking and Mexican cooking are very different. Spanish cooking does not contain the hot peppers that characterize Mexican food. Any peppers in dishes are far more likely to be the mild green bell peppers. In other words, Spanish food is not at all hot and spicy. In Spain, "tortilla" means "omelet", not "cornmeal thing". In fact, corn in Spain is fed far more to the livestock than to people, while rice is frequently enjoyed. Bread very similar to a French baguette is eaten at every meal, not corn. The cuisine of Spain is European with strong Arab influence, whereas Mexican food has deep roots in Aztec and other native cultures. What is your favorite food from Spain? What recipes would you like to share? Since I lived in Spain for three years I got to experience the food alot. Hard to say what my favorite is though since you could order the same thing from two different resturantes and get two different versions. I loved the garlic chicken at La Rufeanas and I miss eating pimentos frios(The long fried green peppers) Excuse the spelling but I haven't used my spanish in awhile. And somthing that is simple to make that I love and have absolutely no idea what it is called. It is a toppa recipe that I got from a caterer in spain. I make these and pealla quite a bit. Heres the recipe. You need one package bacon cut in half. Pitted whole dates either fresh or packaged. Take a half slice of bacon and wrap around the date and put a tooth pick all the way through it to hold it together. Do this for as many as you want to make. For a different flavor you can soak them in orange juice with cinnanmin in it. Bake them at around 350-400 degrees for about a half hour. They have a hard to resist salty-sweet taste. Not over powering on either taste just enough to tickle the tast buds. Thanks for the tapa recipe. Where in Spain did you live? Where do you live now? Here in Philadelphia, I can get the long green peppers--they just call them Italian here. What I miss most is going out for tapas with friends. They just don't have anythng like that here, even in restaurants that claim to be tapas places. They make too much of a production of it so it isn't something you just do casually like in Spain. I lived in Rota across the Bay from Cadiz. I have seen the seed packets for them and you are right they are called Italian peppers. I wish they sold them in the stores around here. Oh yeah, Chesapeake, VA is where I currently live. I went to Spain 2 weeks ago, I spend there a week in Marbella, Andalucia. I stay at an apartment hotel so one of the meals we made ourselves, the other we discover some differences between Spain and my country Portugal. The paella for me it´s a great Spanish dish. Isn't the shore lovely in the area around Marbella! What part of Portugal are you from? I visited there many years ago and loved it. One night I listened to fado and sensed much kinship between it and Spanish cante jondo (related to flamenco). I'd love to learn some Portuguese recipes from you. I've thoroughly enjoyed the Portuguese dishes I've had. I live near Sintra, in a village called Belas, it´s 10 kms from Lisbon. Portugal it´s a great place to visit and has a great gastronomy, if i could translate some recipes I´ll be glad to give some to you, what dish do you liked most? I visited Sintra about 35 years ago, and loved it! The castle there has lovely architecture! I still have a beautiful sweater I bought from an old woman who had a table set up at the roadside near where I got off the bus from Lisboa. It ishand knit with embroidery of sailboats. I'd love any recipe you want to share. I especially love soups and dishes containing seafood or sasusages. I'd prefer recipes not have tomatoes as I'm allergic to them. But whatever you think is good! And thank you so much! We like the food of Rioja a lot. I suppose because we were introduced to it by friends. Horchata de Chufa is something I have always enjoyed. We have a friend who is a pelotati (a game similar to squash)Juan de Armas introduced us to a whole variety of Basque food. Tapas, are of general interest, while we particularly like Gildas. Mejillones Rellenos, are stuffed, baked mussels that are fiery and deilcious. Piperada is an egg Tapas which is rather filling. We also like pinchito morunos, a mildly spicy kebab like tapas. The Enchiladas, empanadas, Gaspachos, paellas are standard fare across the country. 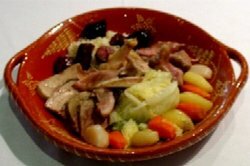 Habas a bean soup and its richer cousin Fabada Asturiana are familiar friends. In New York, Centro Espanol in Upper West Side is a good place to try out authentic Spanish tortillas, chorizo, shrimp. The ambience is outstanding and the prices are modest. We will watch your posts with interest. Enchiladas? Spain? Never saw a one during the years Ilived there. The rest, certainly. I love pinchos morunos! I like the sound of stews? What would be in a stew? I thought rissotto was a rice dish with sea food! Am I close or not at all lol. I would like some Spanish recipies and Mexican if you would like to share thank you! I would like you to be a friend so i have made a request ok. I know there is a difference in the foods. I have eaten a lot of Mexican food, but only one time did I taste food from Spain. It was a long time ago. I just remember that it was a dish of muscles and clams with rice. It was not spicy, and very good. I wish I had a Spain recipe to share, but I don't. I'm sorry. Mussels, clams and rice...must have been paella. I've posted a picture here. Take a look (search the tag paella) and you may recognize it. I'll post a recipe for paella soon.